The property I'm interested in is booked for the dates I am looking for, can you recommend an alternative? We are always happy to assist you in finding the perfect vacation home for your stay. If you find the property you were originally interested in is booked please contact one of our reservation specialists who will be happy to help you find something just as perfect and sometimes even better! To contact us by phone dial 269.857.1477 or email us at [email protected]. Can you recommend some fun activities to explore during our stay? There are always so many different types of activities happening in and around the Saugatuck/Douglas area. Our first recommendation is to stop by the Saugatuck/Douglas Area Business Association website, www.SaugatuckDouglas.com, to view the calendar of events for the time frame you will be visiting. If you are looking for a specific activity or restaurant please contact our reservation specialists either by phone, 269.857.1477, or email, [email protected], and they will be happy to assist you further. Check-in is at our Mill Pond Realty office at 747 Water Street, Saugatuck. From Memorial Day through Labor Day, check-in starts at 4pm and is guaranteed by 6pm. During the rest of the year, as long as there is not a turnover, check-in starts at 3pm and is guaranteed by 5pm. If you arrive to town earlier, you are welcome to give our office a call to see if the property is ready early. At check-in, we'll supply you with the keys, address, and directions to the home, information on our area, and some fun items too. If you arrive after hours, we have an after hours dropbox directly next to our office front door. In the dropbox you will find your check-in packet. Do we need to provide our own linens and towels? Beds will be made up with fresh, clean linens for your arrival and the bathrooms will be stocked with bath towels. You will need to provide your own beach/pool/hot tub towels. Rental rates do not include daily maid service. Daily or bi-weekly maid service can be set up for a nominal fee. You should also bring personal soaps, detergents, garbage bags, and paper products. Are pots & pans / toilet paper / coffee / etc. provided? Does the property have internet access? Internet access varies from property to property. If the property you are looking at has internet access it will be listed under the amenities section. We will provide you with the wireless password at check-in; it will be listed on your check-in packet. We cannot provide technical support should an issue arise with the wireless signal. Please keep in mind that even if the property you are interested in does not offer internet access, the local Saugatuck/Douglas Library, Respite coffee shop in downtown Douglas, or Uncommon Grounds coffee shop in downtown Saugatuck all offer free WIFI access. Dogs are allowed at our pet friendly properties with written permission plus a $100 per pet fee for the length of your stay. Please pick up after your pet and do not leave a mess in the lawn. While our pets are important to us, some of our properties have a strict no pet policy. If evidence of a pet is found at a property that does not allow pets, you will be asked to leave immediately, with full forfeiture of all monies paid, and your account will be charged for professionally cleaning the home and furniture. We abide by ADA guidelines. If you have a service animal, please let us know the answers to the following two questions: 1. Is the animal required because of a disability? 2. What work or task is the animal trained to complete? You do not have to reveal your disability in formulating your reply. While everyone enjoys the emotional, social, and safety benefits that an animal's presence can provide, those benefits do not constitute trained tasks that would transform a disabled person's pet into a legitimate Service Animal under ADA. This standard means that the ADA does not apply to many dogs that function as therapy, emotional-support, and companion animals. We do not charge the standard Pet Fee for a Service Animal, nor is a security deposit increased. Guests remain liable for any damage caused by people or animal. The standard Pet Fee cannot be waived for an emotional support animal nor a therapy animal - only for a Service Animal. Something came up and we need to cancel or reschedule our reservation, what is your cancellation policy? Cancellations made more than 30 days prior to your arrival will be subject to a cancellation fee of 10% of the total rental rate. Cancellation made 30 days or less prior to your arrival will be subject to full forfeiture of the total rental rate. Mill Pond highly recommends contacting your personal insurance agent to inquire about travel insurance. Mill Pond Realty reserves the right to cancel any reservation. We loved our stay so much we are interested in purchasing a vacation home in the Saugatuck area. Who should we contact for more information? 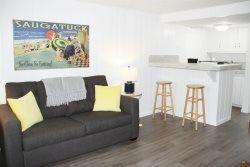 We are so happy you were pleased with your stay and your visit to the Saugatuck/Douglas area. Saugatuck and Douglas are wonderful communities to live year round or to have a vacation home. We are happy to help you explore the ownership opportunities that await you. Please contact Laura Durham by phone at 269.857.1477 or by email at [email protected] for more information. If you have additional questions please visit our Terms & Conditions page found under the About Us tab or contact a rental specialist today.